Reviewed by Mark Rush, Department of Politics, Washington and Lee University. Email: rushm@wlu.edu. 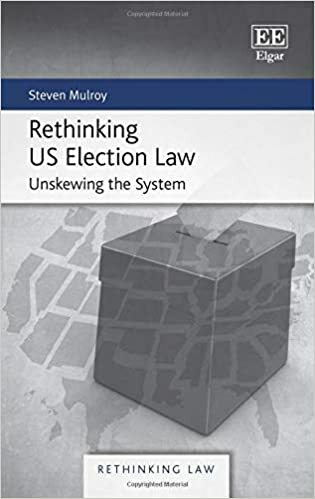 Steven Mulroy’s RETHINKING U.S. ELECTION LAW: UNSKEWING THE SYSTEM is a concise and refreshing book on U.S. election law. The book takes the reader on a tour through the various and profound shortcomings of the country’s reliance on single-member districts (SMDs) and demonstrates that, so long as these SMDs remain the principal building block of U.S. elections, little can be done to resolve the many ailments that afflict the process. It is a powerful, thoughtfully-reasoned and clearly-written argument in favor of electoral reform. Mulroy begins by reviewing the undemocratic aspects of the Electoral College and the Senate, working through the standard criticisms. First, both institutions overrepresent smaller states. The Electoral College winner (and, therefore, the president) may not always win a majority of the popular vote. In the Senate, states representing a minority of the American population can prevent the passage of legislation supported by Senators who represent a majority of the population. With the filibuster, any one member of the Senate can stop the legislative process almost indefinitely. As a result, both institutions block the will of the majority and are, therefore, undemocratic. There is no disputing Mulroy’s analysis, reasoning or conclusion. I certainly agree. But, the fact that the Electoral College and Senate are designed to be un- or counter-democratic is not necessarily grounds to call for their removal or reform. On the one hand, there is no gainsaying that the minoritarian aspects of both institutions have been rendered inflammatory due to the recent polarization of politics, partisanship and political discourse in the United States. While recent election results have been the cause of tremendous consternation and analysis among pundits and scholars – George W. Bush and Donald Trump were both elected without a majority of the popular vote – it is, on the other hand, reasonable to pause and ask whether the country should restructure some or all of its institutions in response to recent political changes that have occurred independent of or despite those structures. The Electoral College reflects the great compromise that led to the creation of a bicameral Congress in which the states were represented by population in the House of Representatives and on equal footing in the Senate. During the Founding Era, there was, as there is now, understandable concern that a minority of large states could dominate the national agenda. So, the bicameral Congress balances the fears of rule by a tyrannical majority in the House against rule by a similarly tyrannical minority in the Senate. Granted, the nature of politics at the end of the 18th century is not a useful guide to managing politics in the 21st century. Still, it is important to keep in mind that the constitutional system was designed to check those majority factions that Madison wrote about in FEDERALIST 10. Converting the elected branches of the government to a strictly majoritarian set of institutions would radically change the conduct of politics and might generate even more constitutional challenges to legislation in the courts. That said, the constitutional stakes in conversion to a national popular vote (NPV) system for the presidency are much lower than those that would arise in an attempt to alter the structure of the Senate. The problem is that both the Electoral College and the Senate are constitutionally enshrined. So, even if enough states organized a [*28] compact to give their Electoral College votes to the winner of the national popular vote, there is little question that such a compact would be challenged in the courts and possibly declared unconstitutional (insofar as such a compact could be regarded as tantamount to a constitutional amendment without going through the amendment process). I think this aspect of Mulroy’s analysis would be made stronger if he added a comparative element. Of course, an author may focus a work in any manner he or she chooses. But, to the extent that Mulroy emphasizes American electoral exceptionalism throughout the book (Stephanopoulos 2013), it would be consistent to cast the impact and function of American federalism in a broader light. Many federal nations experience deviations from representational equality similar to those in the USA (see Rush 2007). In Canada, residents of Nunavut or Newfoundland have significantly more voting power per person than those of Ontario or Quebec. In Spain, you get more voting bang for the Euro if you live in Oviedo instead of Madrid or Barcelona. In the European parliament, Belgians have much more per capita voting power than Germans. The United Nations is not a federation; still, all countries get one vote each in what is an inherently unrepresentative body (the Security Council notwithstanding). So, while the reasoning underpinning the states’ equal representation in the Senate may be an artifact of late 18th century political thought, the practice of deviating from strict equality of individual voting power in favor of enhancing the representing of smaller geographic entities endures and is common globally in the 21st century. Granted, none of these nations elect a president by an Electoral College with the capacity to generate counterintuitive election results such as those in 2000 and 2016. Nonetheless, the disproportionate, countermajoritarian structure on which the Electoral College is based is hardly uncommon. These are quibbles. Mulroy does a thoughtful job of laying out the undemocratic aspects of the Senate and the Electoral College in a manner that prepares the reader to move on to a discussion of the truly poisonous aspect of U.S. election law: gerrymandering. As he notes, the U.S. is essentially alone in the world in allowing elected legislators to take an active role in the process of drawing the districts from which they will be elected. The conflict of interest is astonishing – and yet, this practice endures. Although Mulroy relies on seat-votes ratios and similar aggregate measures of partisanship to demonstrate the undemocratic nature of the single-member districts system, I believe the conflict of interest is a much stronger basis for criticism. The use of aggregate measures of bias and swing in legislative elections remains contested territory in political science. Aggregating Democratic and Republican votes cast in districts into one, statewide summary count simply dismisses (or at least overlooks) the clear and obvious impact of candidate- and district-specific conditions on partisan voting (See generally Cho 2017; Chen and Rodden 2013). If there are strong or uncontested incumbents in any districts, the statewide vote totals will be skewed in their party’s favor (Rush, forthcoming, 2019). The Supreme Court said as much in GILL V. WHITFORD. This is especially true in states that draw majority-minority districts to comply with the Voting Rights Act. The heavy concentration of minority voters into districts where elections are frequently uncontested and won by strong minority incumbents inevitably renders statewide seats-votes ratios meaningless. But, the conflict of interest inherent in the U.S. redistricting process is clear. Granted, some states have resorted to using nonpartisan redistricting commissions. Still, as Mulroy demonstrates, the SMD electoral system constrains the capacity of even the most well-intentioned commission to design bias-free voting districts. In discussing the limits of judicial remedies for gerrymandering, Mulroy demonstrates that courts justifiably hesitate to enter into the “political thicket” of redistricting analysis. The absence of clear definitions or measures of fairness leave the courts without a means of [*29] determining what is a fair redistricting system, how much deviation from perfect fairness is normal or acceptable, and how to address such deviations when the Voting Rights Act requires the creation of majority-minority districts. Put differently, the courts are forced to accommodate acceptable pro-minority gerrymandering designed to repair past injustices while simultaneously militating against unfair partisan gerrymandering. Furthermore, partisan gerrymandering cases deviate from racial gerrymandering insofar as race is immutable and partisanship is not. Voting behavior is conditioned by Election Day choices. Change the choices with which voters are presented (either by redistricting or incumbent retirement) and voters will change their behavior. Mulroy suggests that courts could use partisan registration data (in states that have partisan registration) to establish a baseline partisan profile (pp. 52-53). But, registration data is based on a preference that is not linked to electoral choices. Regardless of one’s partisan predilections, one’s partisan behavior is conditioned by Election Day choices. So, using registration data could prove to be as undemocratic as using, say, public opinion polls: what a voter says or thinks is not the same as what he or she does at the polls. Democracy is based on votes, not polls. This review so far addresses issues that are endemic to a political system that uses SMDs as the building blocks of its electoral system. American law has spent some 55 years wrestling with how to ensure representational fairness (if not proportionality) in an SMD electoral framework whose design and function militate against both. The strongest part of Mulroy’s analysis, therefore, lies in chapters 7-10 where he makes a strong case for dispensing with SMDs in favor of more proportional voting systems with multimember districts. In these chapters, Mulroy quickly and clearly takes the reader through the basics of instant runoff voting (IRV), limited voting, cumulative voting and ranked choice/single transferable voting (STV). These chapters serve as an efficient, accessible primer on electoral system choice and make a compelling case for replacing SMDs with multimember districts and some form of proportional representation. The use of alternative electoral systems is not foreign to the U.S. An increasing number of municipalities use a combination of multimember districts and STV (See Mulroy 1999; Spencer, Hughes and Richie 2015). Nine states use at least some multimember districts to elect state legislators (p. 171). With multimember districts there would be fewer districts to draw, fewer lines to gerrymander and correspondingly fewer reasons to challenge districting plans in court. Voters would be spared the problem of uncontested elections that are so frequent in SMDs because there would always be several candidates from which to choose in multimember districts. The benefits of multimember districts go much further than the obvious improvement in improving (actually guaranteeing) the quality of voter choice. They would create opportunities for smaller parties to gain representation. They would enable the representation of interests that are not concentrated into geographically compact areas. Minority voters who are packed into uncompetitive majority-minority districts (which promote descriptive representation but do nothing to offer minority voters a meaningful choice on Election Day) would actually have the opportunity to vote for more than one candidate. Multimember districts would add meaning to election results that are distorted to the extent that they force American voters to choose between candidates who, for the most part, bear the labels of only two political parties. Despite the obvious benefits to dispensing with the SMD system, there would certainly be resistance to their use. One immediate issue would be the increased cost of campaigning. Incumbents who are comfortably nestled into uncompetitive districts would actually have to go out and campaign for reelection. The Democrats and Republicans would have to ward off challenges not only from each other, but also from nascent minor parties that could now gain representation. Organizing the state legislatures or Congress would become more challenging [*30] because, in a multiparty system, it would be less likely that one party would secure a majority of the seats. As a result, American politics would experience “parliamentary system problems” (p. 161). No doubt, systemic change such as electoral reform will cause uncertainty as voters, candidates and legislators wade into unfamiliar waters. But, it is clear that the U.S. electoral system is based on antiquated notions of representation that distort the voice of the people and amplify the power of incumbents to insulate themselves from popular accountability. Mulroy offers a compelling argument for electoral reform that should be required reading for the next redistricting cycle or for any undergraduate class on voting rights and redistricting. Even the most skeptical critic would have difficulty refuting his analysis. GILL V. WHITFORD, 585 U.S. ___ (2018). Chen, Jowei and Jonathan Rodden. 2013. “Unintentional Gerrymandering: Political Geography and Electoral Bias in Legislatures.” QUARTERLY JOURNAL OF POLITICAL SCIENCE 8: 239-69. Cho, Wendy K. Tam. 2017. Essay: Measuring Partisan Fairness: How Well Does the Efficiency Gap Guard Against Sophisticated As Well As Simple-Minded Modes of Partisan Discrimination?” UNIVERSITY OF PENNSYLVANIA LAW REVIEW 166:17-36. Mulroy, Stephen J. 1999. “Alternative Ways Out: A Remedial Road Map for the Use of Alternative Electoral Systems.” NORTH CAROLINA LAW REVIEW 77: 1867-1924. Rush, Mark E. 2007. “Voting Power in Federal Systems: Spain as a Case Study. PS: POLITICAL SCIENCE AND POLITICS 40: 715-20. Rush, Mark E. 2019. “The Efficiency Gap after GILL v. WHITFORD.” Forthcoming, SOCIAL SCIENCE QUARTERLY. Spencer, Andrew, Christopher Hughes and Rob Richie. 2015. “Escaping the Thicket: The Ranked Choice Voting Solution to America’s Redistricting Crisis.” CUBMERLAND LAW REVIEW 46: 377-423. Stephanopoulos, Nicholas. 2013. “Our Electoral Exceptionalism.” UNIVERSITY OF CHICAGO LAW REVIEW 80:769–858. © Copyright 2019 by author, Mark E. Rush.